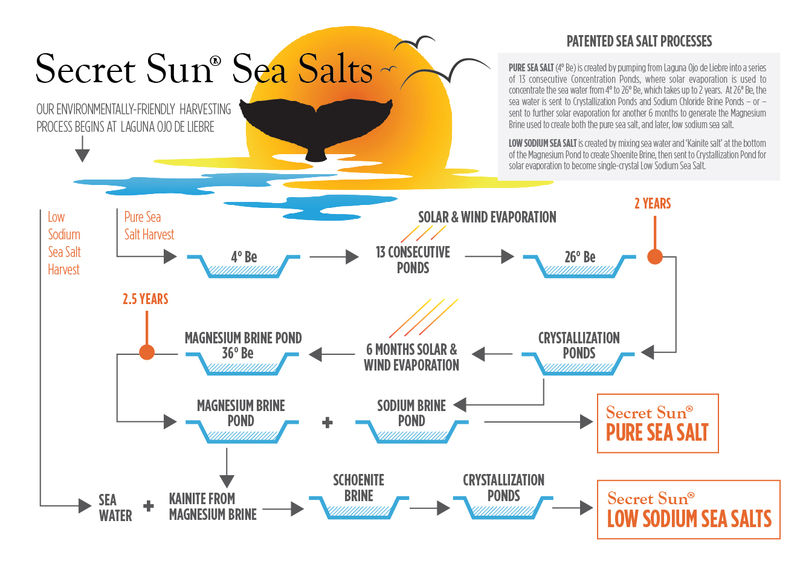 The process of harvesting Secret Sun® Sea Salts begins at a beautiful lagoon off the Pacific coast in Baja California Sur, Mexico. Unlike mined salt, we use the sun as our main harvesting tool. Our environmentally friendly, patented process produces single-crystal, low sodium sea salts that offer big flavor and unmatched purity. From the lagoon, our salt begins a journey that takes two and a half years to complete. Salt water from the lagoon flows into a series of gravity fed condensation ponds. Within each pond minerals and other solids settle out, resulting in increasingly pure salt. The sun overhead continually evaporates the water and crystallizes the salt. By the time the salt leaves the final crystallization pond, it has been formed into a natural, single-crystal structure of sodium chloride and potassium and magnesium sulfate. The result is a clean, pure salt flavor in a reduced sodium crystal. The lagoon provides nearly unlimited salt, so we can harvest quantities to meet all customer needs.